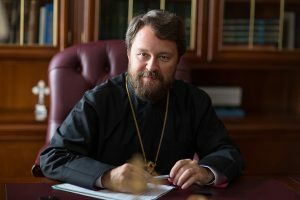 On April 10, 2013, Metropolitan Hilarion of Volokolamsk, head of the Moscow Patriarchate’s department for external church relations, met with Georgi Parvanov, former president of Bulgaria (2002-2012), at the DECR. Participating in the meeting were Archpriest Igor Yakimchuk, DECR secretary for inter-Orthodox relations, Archpriest Sergiy Zvonarev, DECR secretary for the far-abroad countries, Bulgarian Ambassador to Russia Bojko Kocev, Chairman of the Bulgaria-Russia Forum S. Charenkova, deputies of the 41st Parliament of Bulgaria Rumen Petkov and Andrej Pantev, the first secretary of the Bulgarian Embassy Vasilka Kehajova, and Archimandrite Feoktist (Dimitrov), representative of the Patriarch of Bulgaria to the Patriarch of Moscow and All Russia. Metropolitan Hilarion welcomed the high guest on behalf of His Holiness Patriarch Kirill of Moscow and All Russia and wished him success his in public service. He told Mr Parvanov about relations between the Russian and Bulgarian Orthodox Churches and the Russian and Bulgarian peoples, noting that mutual support was always an important feature of these long-standing relations. He also spoke about the service of the Russian Orthodox Church today and her consolidating role in Russian society, making a special mention of the social and charitable mission of the Church. He shared with his guests his experience of teaching Basic Religious Cultures and the Secular Ethics in Russian schools. Mr Parvanov, on his part, thanked the DECR chairman for the opportunity to meet and conveyed to Patriarch Kirill best regards from Patriarch Neofit of Bulgaria. 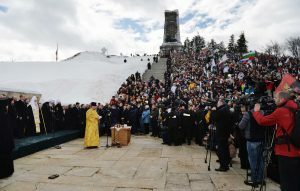 He also spoke about the presentation of the book ‘Russian Monuments in Bulgaria’ which took place on April 8 in Moscow. Participation in this event was the primary purpose of his present visit to Russia. They also discussed a project for building in the Russian capital city a church dedicated St Cyprian of Moscow who was a native of Bulgaria. In the end of the meeting Metropolitan Hilarion and Mr Parvanov exchanged tokens of the meeting.